Whether you need to move once a year or once a lifetime, whether you need to move furniture, machinery or office equipment - a professional mover can simplify the process. 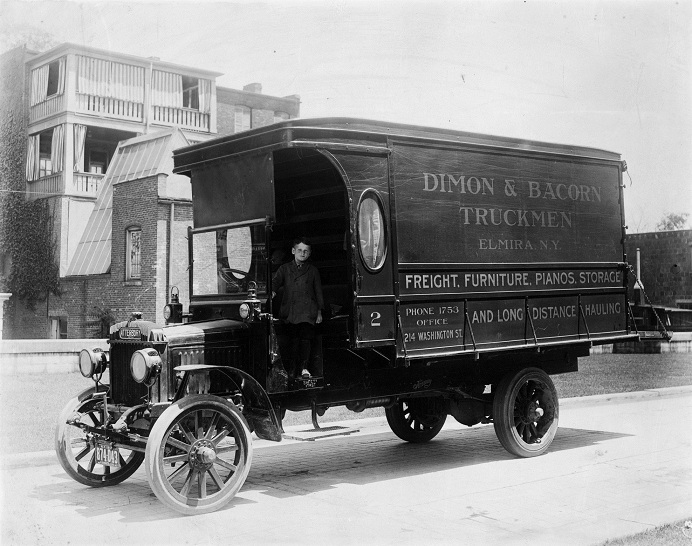 At Dimon & Bacorn we have built our reputation with over 100 years of experience in worry-free, reliable moving at reasonable rates. 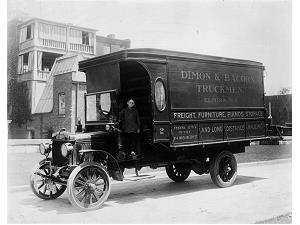 Harry Dimon and Levi Bacorn founded the company in the early 1900s. They began by hauling ashes, hay and meat with a horse and buggy, serving local businesses and the general public. Their first facility, which consisted of an office and a warehouse, was located on the eastside of Elmira, New York. With the advent of trucks driven by the internal combustion engine, their business changed rapidly. The two men were among the first in the area to operate one of these vehicles and they began hauling local drayage for the railroads, as well as, food and home furnishing. Kenneth H. Dimon, son of Harry Dimon, continued the firm's expansion into such areas as steel hauling, long distance moving and the transporting of heavy machinery and rigging. During this time period, the fleet of trucks grew from one to five. In the late 1960's, Dimon & Bacorn became an agent for northAmerican Van Lines. A short time later Daniel F. Dimon Sr., grandson of the founder, became the third generation of the Dimon family to operate the business. He continued the family's tradition of high quality work at a fair price. Daniel F. Dimon Sr. expanded the company's service into the Ithaca and Binghamton areas. During this time period the company expanded to three offices and a modern fleet of 20 tractor and trailers, 20 straight trucks and numerous other special vehicles. The Company expanded into other services under Daniel F. Dimon Sr. such as self-storage units, record storage and specialized hauling. Today, the fourth generation of the Dimon family is proud to lead one of the oldest and most successful family businesses in the Southern Tier of New York State. Daniel F. Dimon Jr. and Michael Dimon great grandchildren of the founder currently run the Company under the same values of their predecessor's quality service at competitive rates. Under their guidance Dimon & Bacorn has maintained all of the services and capabilities and added new services such as Export Crating.